A cozy cabin can be a great way to spend a quiet vacation getting closer to nature. However, having one built can put people in a situation where they risk damaging the very nature they came out to enjoy. Solar power isn't just for homes in urban areas—it can also be a great way to boost the available power of your cabin. Solar energy is clean and readily available in many natural areas where you might consider building your eco-friendly cabin. By not having power lines stretched out to your cabin, the plant and animal life won't be disturbed more than necessary for the construction of the house itself. It'll be beneficial for the environment in general as well by reducing your carbon footprint. You can also implement more energy-efficient HVAC and electrical systems so that your overall energy consumption remains low and sustainable. The way you dispose of waste in your cabin will have a direct impact on the environment, as well. Connecting to a city sewage system isn't practical for most cabins, and having sewage disposal that leaves the waste untreated can be harmful to the local wildlife. Thankfully, there are domestic sewage system plants that can be installed as part of your cabin's waste disposal system. This kind of system can minimize the risk of untreated water leaking out into the local water system, while also allowing for full use of modern plumbing appliances. These tanks are relatively simple and help treat both water coming in, as well as water going out. You can also recharge your groundwater on-site to get clean, usable water with minimal draw from local reserves. Cutting down trees isn't a necessity in order to build a modern mountain cabin. One way you can get a cabin that appeals to you and helps the environment at the same time is to use recycled timber. Choosing recycled timber means you're lessening the demand for its virgin lumber counterpart and helping to decrease deforestation overall. Recycled timber is also much stronger than fresh wood, as it has been put through compression processes that'll reduce the material's natural tendency to absorb moisture. You may want to get an outdoor bin to put your cabin's trash into for proper disposal later. However, if you do this, it's essential to use a model that can accept a padlock or two. Since you'll be sharing this area with various critters in their natural habitats, it's important to ensure that they don't have access to your garbage. The smell alone will draw them, and they're able to smell much more keenly than humans, so simple containment won't be enough. Your outdoor bins should be made of strong metal to keep even the largest of local wildlife out. This is not only for your health and safety, but for that of the animals as well. 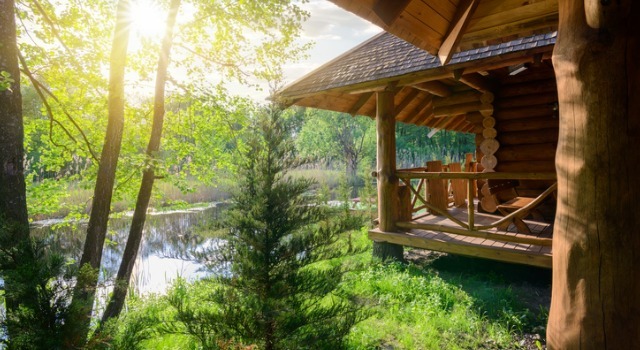 Cabins offer rustic appeal, relative simplicity and a way to be in the center of nature while maintaining a level of comfort that works for you. Not all cabins are built equally, though. You can use some of the steps provided above to make sure you don't expand your footprint in nature and can enjoy it to the fullest extent! Meghan Belnap is a freelance writer who enjoys spending time with her family. She finds happiness in researching new topics that help to expand her horizons. If you're interested in learning about sewage system plants for your home, Belnap recommends Econocycle.